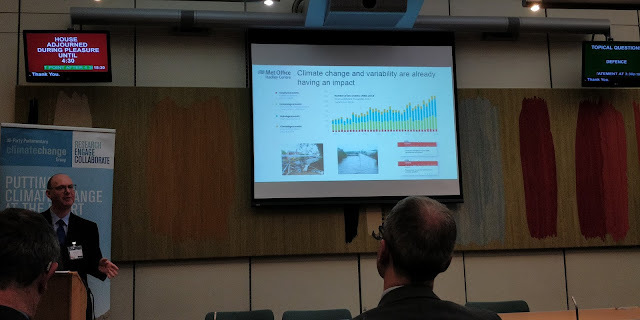 On a sunny day earlier this week, I attended the UK Climate Projections 2018: From science to policy making, meeting in Westminster on behalf of the Cabot Institute. Co-hosted by the All-Party Parliamentary Climate Change Group and the UK Met Office, the main purpose of this event was to forge discussions between scientists involved in producing the latest UK Climate Projections (UKCP18) and users from various sectors about the role of UKCP18 in increasing the UK’s preparedness of future climate change. Many people in my constituency come and ask about climate change every day. The event began with an opening remark by Rebecca Pow, the MP for Taunton Deane in Somerset. Somerset has seen some devastating floods over the years, and a new land drainage bill was passed a week prior to manage flood risk in the area. Constantly faced with questions from her constituents about climate change, Rebecca is particularly interested in regional climate change, both at present and in the future, and any opportunities that may arise from it. Everyone would like a model of their back garden. Prof Sir Brian Hoskins, the Founding Director and Chair of the Grantham Institute for Climate Change and the Environment, and Professor in Meteorology at the University of Reading, gave an overview on climate projection. He listed three main sources of uncertainty in 21st century climate projection: internal variability, model uncertainty, and human activity uncertainty. Climate scientists deal with these uncertainties by using large ensembles of simulations, a range of climate models, and a range of climate scenarios. However, there is always tension between model resolution, complexity and the need for many model runs in global climate projections due to constraints in computer resources. Regional climate models can be embedded in global domains to provide local weather and climate information, but they cannot correct large scale errors. The peer-reviewed UKCP18 provide both the statistics of global climate by combining data from different climate models and runs, and regional daily data for the UK and Europe. A greater chance of warmer, wetter winters and hotter, drier summers. 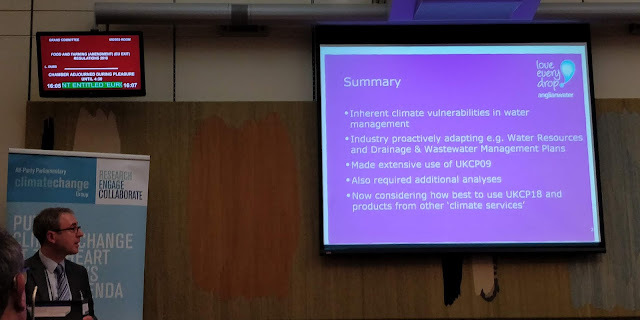 This was one of the headline results from UKCP18 shown by Prof Jason Lowe, Head of Climate Services for Government at the Met Office Hadley Centre. UKCP18 is an update from its predecessor, UKCP09, but with constraints from new observations and data from more climate models from around the world. The horizontal resolution of regional climate projections for the UK and Europe has increased from 25 km in UKCP09 to 12 km in UKCP18, with an even higher resolution (2.2 km) dataset coming out in summer 2019. UKCP18 results show that all areas of the UK are projected to experience warming, with greater warming in the summer than the winter. Summer rainfall is expected to decrease in the UK, whereas winter precipitation is expected to increase. However, when it rains in summer it may rain harder. Sea-level rise will continue under all greenhouse gas emission scenarios at all locations around the UK, impacting extreme water levels in the future. 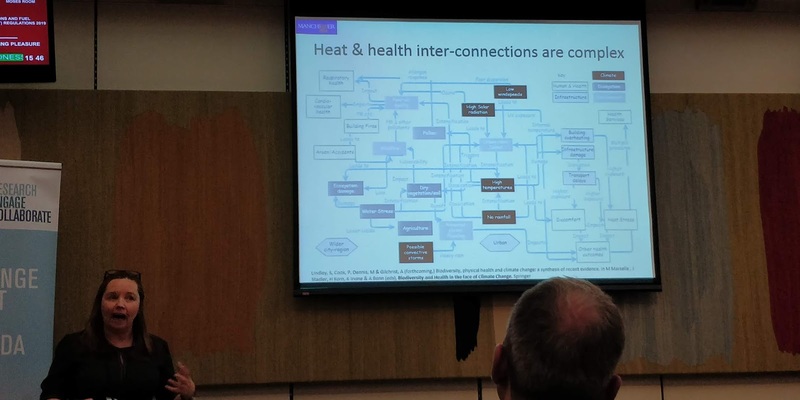 Heat and health inter-connections are complex. 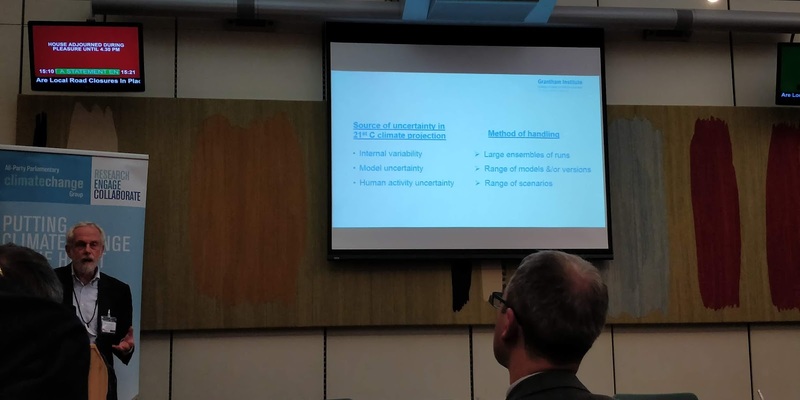 Prof Sarah Lindley, Professor of Geography at the University of Manchester, shared how UKCP18 could be used to study the health effects of climate change and urban heat in the UK. Many of us would remember how hot it was last summer; by 2050, hot summers of that type may happen every other year, even under a low greenhouse gas emission scenario. The most extreme heat-related hazards are in cities due to the Urban Heat Island effect (UHI), i.e. urban areas are often warmer than surrounding rural areas. For instance, Manchester’s UHI intensity (difference between urban and rural temperatures) has increased significantly since the late 1990s. By the end of this century, the city of Manchester is projected to be 2.4ºC warmer than its surrounding rural area in a UKCP09 medium emission scenario. With an aging population, UK’s vulnerability to heat may increase in the future. Both exposure and vulnerability to heat contribute to heat disadvantage. High-resolution UKCP18 data, together with social vulnerability maps of the UK, provide new opportunities to heat disadvantage and adaptation research. European birds will need to shift about 550 km north-east under 3ºC warming. The next speaker was Dr Olly Watts, Senior Climate Change Policy Officer for the RSPB, the largest nature conservation charity in the UK. Climate adaptation is an important aspect of nature conservation work, as it should be in everyone’s work. The Climatic Atlas of European Breeding Birds finds that not only will European birds shift 550 km under a likely 3ºC increase in global average temperature, but also a quarter of the bird species will be at high risk. Currently 5000 bird species are changing species distribution, and they face an uncertain future. The UKCP18 data of 2-4ºC warmer worlds could be used to derive qualitative strategies to build wildlife resilience against climate change. 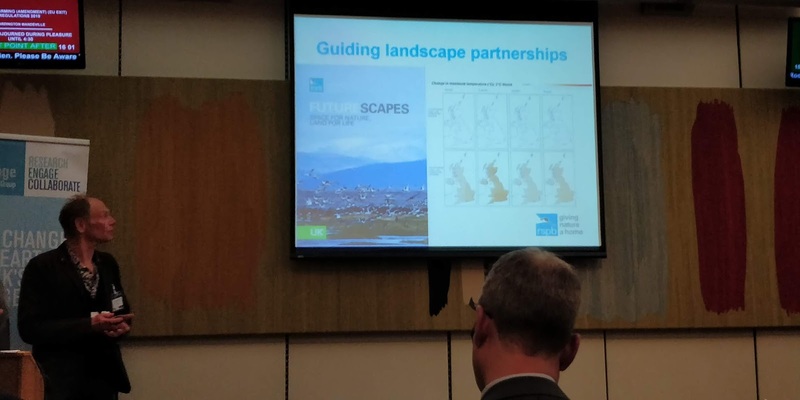 Adaptation strategies including informing nature reserve management will be in place across the RSPB conservation programme. The RSPB will also use UKCP18 data to raise public awareness of climate change. Water demand can increase by 30% on a hot day. Dr Geoff Darch, Water Resources Strategy Manager at Anglian Water, began his talk by highlighting the inherent climate vulnerabilities in water management in the East of England. It is a “water stressed” region that has low lying and extensive coastline, sensitive habitats, and vulnerable soils. On a hot day, water demand can go up by 30%. Climate change alone is expected to have a total impact of 55 Ml/day on water supplies in the region by 2045. A growing risk of severe drought means an additional impact of 26 Ml/day is expected, not to mention the impacts of population growth. The water industry is proactively adapting to these challenges by setting up plans to reduce leakage and install smart meters for customers. UKCP09 has been used extensively for climate change risk assessment across the water sector; the latest UKCP18 could be used in hydrological modelling, demand modelling, storm impact modelling, flood risk assessment, and sensitivity testing to assess the robustness of water resources management solutions under a range of climate scenarios. This blog was written by Cabot Institute member Dr Eunice Lo, from the School of Geographical Sciences at the University of Bristol. Her research focusses on climate change, extreme weather and human health. “What is science? Why do we do it?”. I ask these questions to my students a lot, in fact, I spend a lot of time asking myself the same thing. And of course, as much as philosophy of science has thankfully graced us with a lot of scholars, academics and researchers who have discussed, and even provided answers to these questions, sometimes, when you are buried under piles of papers, staring at your screen for hours and hours on end, it doesn’t feel very science-y, does it? As a child I always imagined the scientist constantly surrounded by super cool things like the towers around Nicola Tesla, or Cousteau being surrounded by all those underwater wonders. Reality though, as it often does, may significantly differ from your early life expectations. I should have guessed that Ts and Cs would apply… Because there is nothing magnificent about looking for that one bug in your code that made your entire run plot the earth inside out and upside down, at least not for me. As part of Green Great Britain Week, supported by BEIS, we are posting a series of blogs throughout the week highlighting what work is going on at the University of Bristol's Cabot Institute for the Environment to help provide up to date climate science, technology and solutions for government and industry. We will also be highlighting some of the big sustainability actions happening across the University and local community in order to do our part to mitigate the negative effects of global warming. Today our blog will look at 'Technologies of the future: clean growth and innovation'. Will July’s heat become the new normal? For the past month, Europe has experienced a significant heatwave, with both high temperatures and low levels of rainfall, especially in the North. Over this period, we’ve seen a rise in heat-related deaths in major cities, wildfires in Greece, Spain and Portugal, and a distinct ‘browning’ of the European landscape visible from space. Leo Hickman, Ed Hawkins, and others, have spurred a great deal of social media interest with posts highlighting how climate events that are currently considered ‘extreme’, will at some point be called ‘typical’ as the climate evolves. In January 2007, the BBC aired a special programme presented by Sir David Attenborough called "Climate Change - Britain Under Threat". Antarctica: Why are we here again?